HOW CAN I ENSURE THAT ALL VOICES ARE HEARD? 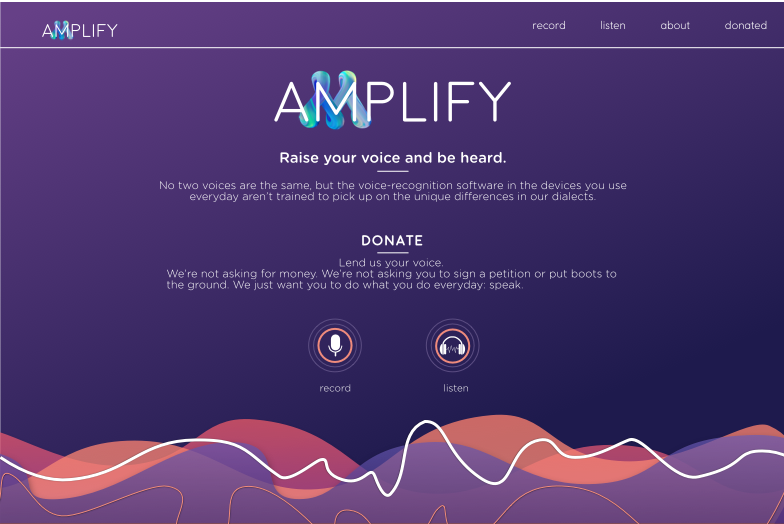 An open sourced, crowd sourced platform that accepts voice donations. THERE ARE 375 MILLION PEOPLE GLOBALLY WHO SPEAK ENGLISH AS A SECOND LANGUAGE. Those who speak English as a second language are misunderstood by voice assistants. Emerging technology of voice is pervasive. 50% of all searches will be voice searches by 2020. To train a machine to recognize speech, you need a lot of audio samples. First, researchers have to collect thousands of voices, speaking on a range of topics. They then manually transcribe the audio clips. Inherent biases creating non delightful experiences. 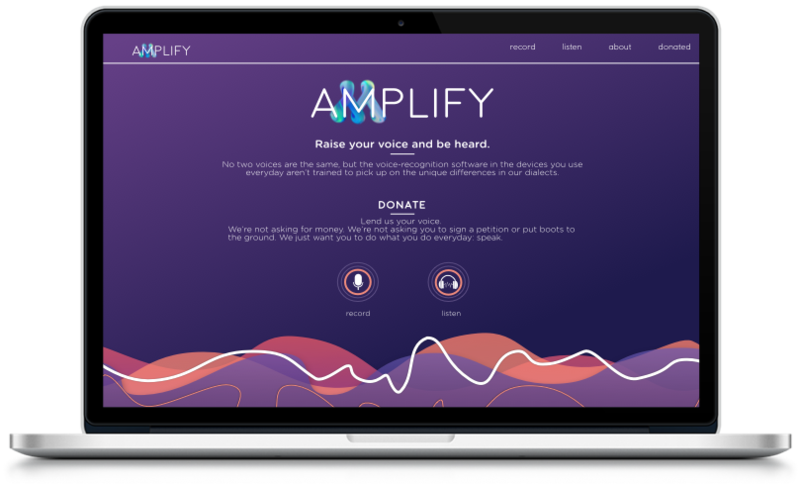 AMPLIFY an open-source & crowd sourced database where people can donate their voices. Specifically targeting those who speak english as a second language. Allowing anyone to create an inclusive voice system. 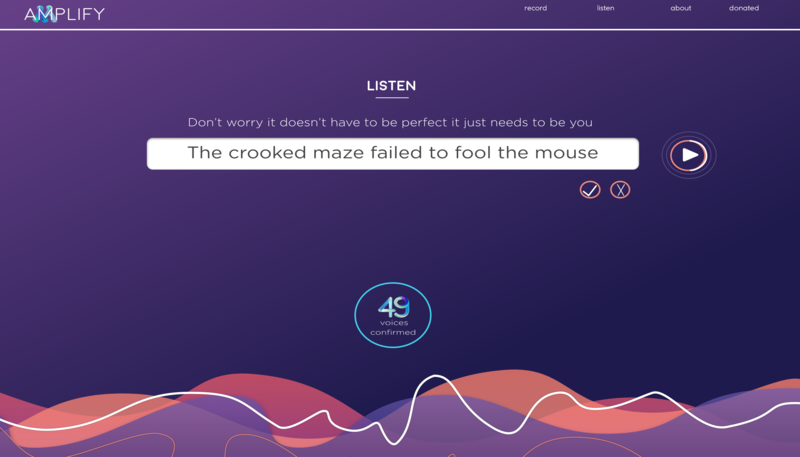 AN AI CAN ONLY RECOGNIZE WHAT IT'S BEEN TRAINED TO HEAR. ITS FLEXIBILITY DEPENDS ON THE DIVERSITY OF THE ACCENTS TO WHICH ITS BEEN INTRODUCED. When I began my independent study I was excited to focus an entire semesters worth of energy on exploring conversation design and accessibility. 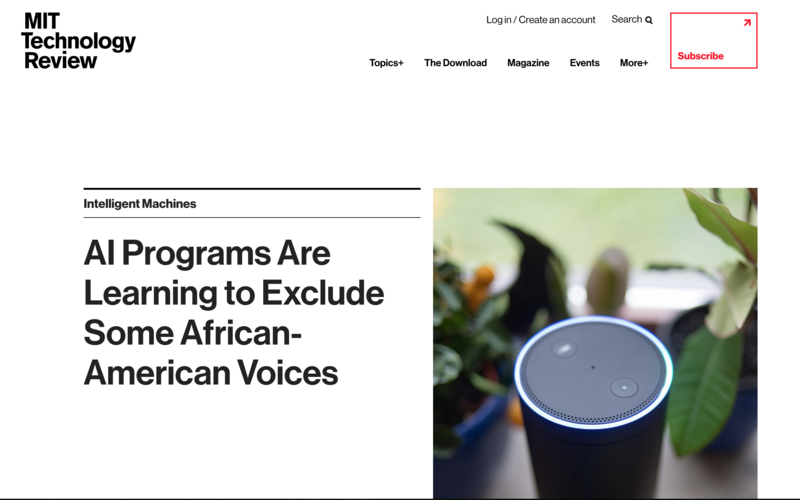 Throughout my research I realized that I had jumped ahead and could not create accessible inclusive products using voice if there were issues with voice assistants being inaccessible with extreme bias. As a woman and person of color I am just as excited as I am worried about the advancement of AI and machines due to inherent bias projected from creators to machine. 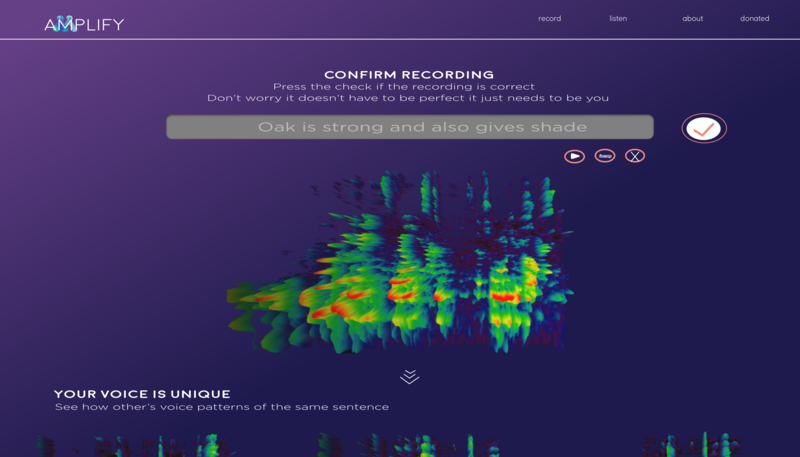 Create an open-source crowd sourced database so that anyone can create an inclusive voice system. Provide a platform Collect voices to empower those who feel as though their voices have been unheard to take action and donate. All of the voice donations that are being collected need to be verified. 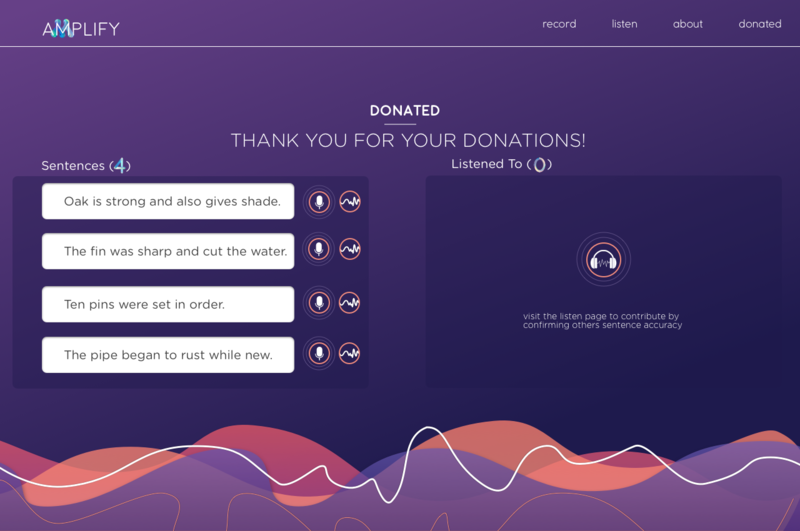 Therefore another way for people to participate is to donate their time and ears to listen to donations. Donations will be listened to by 5 different verifiers for accuracy. To empower people to share and feel confident in themselve and their voice I wanted to promote positivity by showing side by side how every person's voice is different. Many people who speak english as a second language are very self conscious and scared but their voice is who they are and it is powerful. 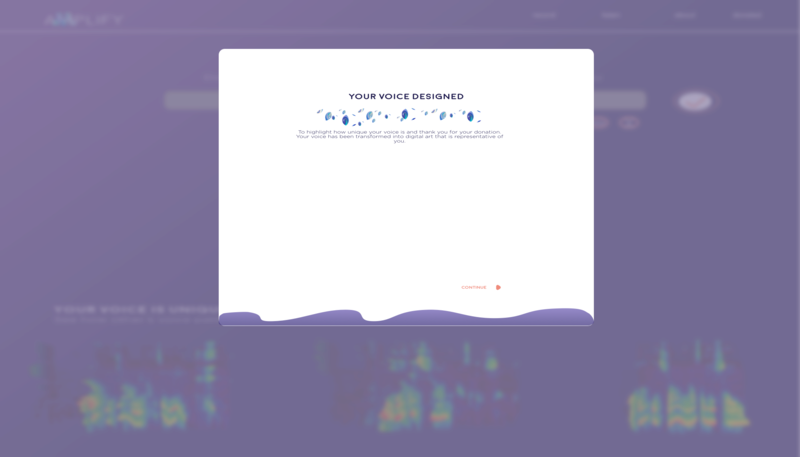 To further express the uniqueness of one's voice, each time someone donates their voice a unique 3D design will be created based off of their sound waves, inflections, pauses and pulses. To ensure data is being collected and tagged properly I implemented a calibration before the recording donation begins where users will state 3 words to determine their dialect. The words provided are Accent Tag Words, which by their pronunciation can determine a person's dialect. 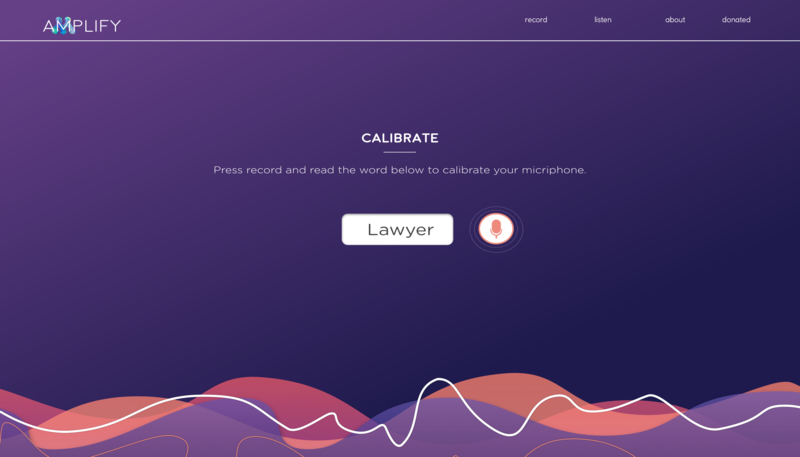 The Harvard sentences are a collection of sample phrases that are used for standardized testing of Voice over IP, cellular, and other telephone systems. They are phonetically balanced sentences that use specific phonemes at the same frequency they appear in English. Conversation design is becoming increasingly popular especially with the steady rise of voice assistants. But there has been a stagnant change in the voices used to train these assistants.